I generally don't like the political season, with all the false accusations and negative spin the candidates lambast their opponents with. I hit the mute button I'll bet 200 times, since TV becomes even more a cesspool than it usually is. But once the election's over peace and harmony return, and the bastards are gone for another couple years. The only candidate I really like -- an institution since my 30s -- is Sheriff True Dillingham. 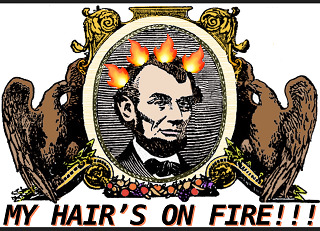 He was up for reelection this year, and of course it was a foregone conclusion that he'd win. With the same great campaign he's run since his first try, the "Willing Man" theme. It's his brand, as beloved in these parts as Smith Bros. cough drops or Elsie the Cow. Obviously, I'm a willing man for Dillingham! I hope you are too! 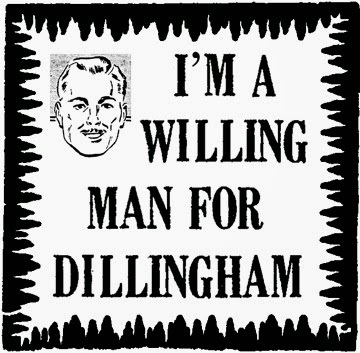 The usual assortment of buttons, posters, and stickers were all over the county, asking the question that really only has one answer, "Are you a willing man for Dillingham?" Most guys who know their stuff -- and zip it up everyday -- proclaim a hearty and hale "Yes!" I suppose there has to be a few guys against him, like the sacrificial lamb the other party runs and his few supporters, stragglers from the truth, head-butters against the inevitable. 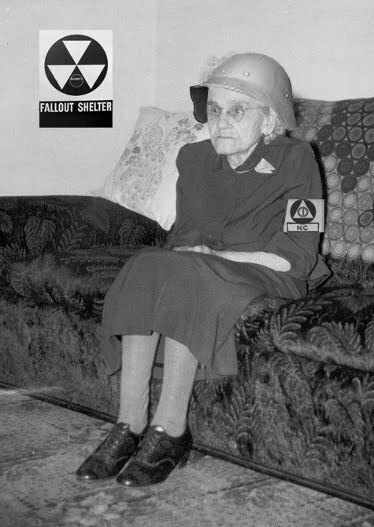 I regret to say Grandpa never lived in the Dillingham years. He would've loved him. Being a manly kind of guy. Grandpa was always tickled by macho stuff, often times striking out in a colorful string of obscenities and profane put-downs against anyone who saw it differently. I guess I got a lot of that from him. Dillingham's a man from the same mold as Grandpa, although he obviously keeps it cleaner, having more supporters looking up to him, including women. We've had such good sheriffing from Dillingham that the women generally look up to him even more than the men! But their devotion is kept very demure -- and much of their guidance comes from the campaign -- as they declare their allegiance. 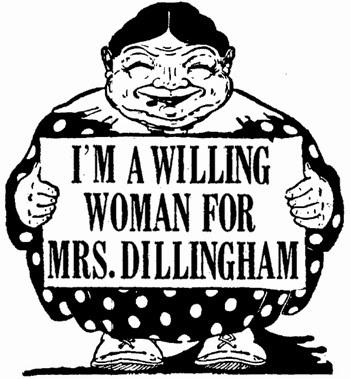 For the men it's, "I'm a willing man for Dillingham," but for the women it's, "I'm a willing woman for Mrs. Dillingham." I like that, I really do, everything in its appropriate place. Women aren't left out of declaring for Dillingham himself, if they choose, but most see no reason to cross boundaries unnecessarily or call into question the nature of their support. They're quite happy to say, "My husband's a willing man for Dillingham." And lest anyone think unmarried women are simply out, they're not, as they have the button, "I know a willing man for Dillingham." It's these women buttons, especially from the earliest campaigns, that are much sought-after by collectors. Another good one is the check box button, "I know a willing man for Dillingham: My ___ Boyfriend, ____ Uncle, ____ Father, ____Other." As I said, everyone likes Dillingham except criminals and their families. And even some of them like him, because at some level they know they needed help and/or tough love. Normal families adore him, which goes without saying. It's something every generation can share. Really, just to live in the Dillingham years is an honor, memories of which we will surely pass on. Fathers hope they can live up to the Dillingham ideal, Moms hope their daughters find a Dillingham-type guy to marry, and naturally devotion to Mrs. Dillingham is also an inspiration for girls, young or old. 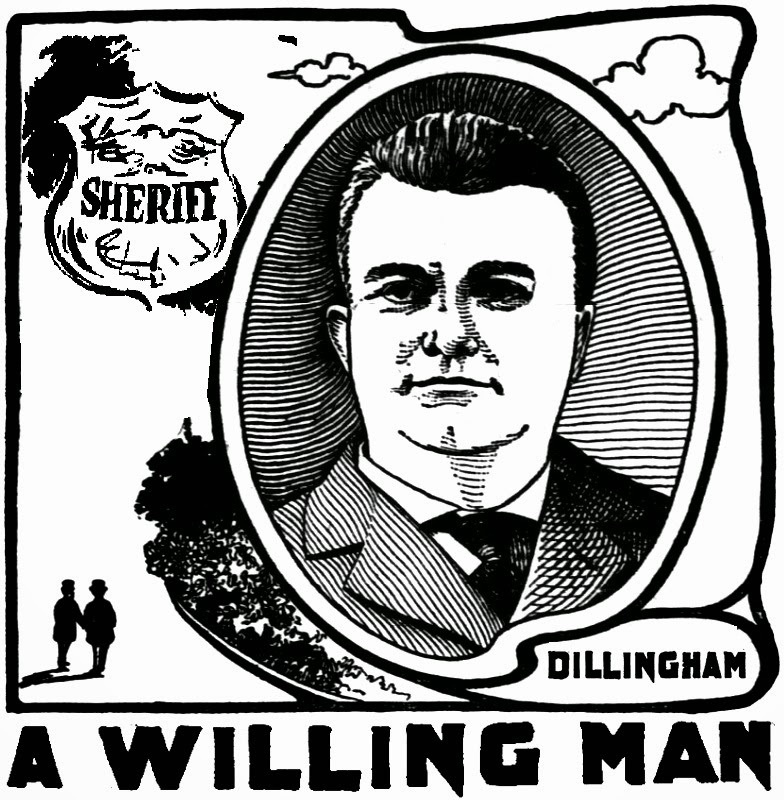 But it's men most of all who are truly in the most literal sense of the word "Willing Men for Dillingham." Whether you're a boy learning of him, a younger man, a middle-aged man, or an older man voting, you are able to see his unreflected glory, while the women, with all their devotion to Mrs. Dillingham, see Dillingham's glory in a more reflected way. This helps keep them true. As for me, now I'm older. 30 years ago I was a younger willing man for Dillingham. As years passed I matured into a middle-aged willing man for Dillingham. And now I'm proud to say I'm a much older willing man for Dillingham, not always as mentally sharp as I used to be, but I hope when my last memories perish from the face of the earth, at least I'll be able to maintain some vestige of this deep-seated knowledge, and will remain a willing man for Dillingham, world without end.